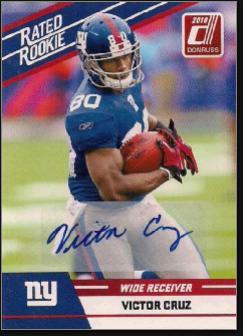 Victor Cruz was born November 11, 1986 in Paterson and raised by his mother, Blanca Cruz. As a boy, Victor pursued his two passions, football and dancing. His grandmother taught him how to salsa when he was 11, and he pays tribute to her now whenever he scores a touchdown. Victor was a football and basketball star at PS 21 in Paterson, and later at Paterson Catholic High School. Victor played receiver and defensive back for Benjie Wimberly’s Cougars and was All-State as a senior in 2003. He scored 19 touchdowns for the team that went undefeated on its way to the NJ Parochial School championship. After accepting a scholarship from UMass, Victor spent a year Bridgton Academy in Maine to get his academics college-ready. The Minutemen red-shirted him as a freshman, so his first varsity season was 2006. He did not crack the starting lineup until 2008, as a junior. That year—and also 2009—Victor was All-Colonial Conference, reeling in 130 passes in two season for 1,932 yards and 10 touchdowns. Considered too small to play in the NFL, Victor went undrafted in 2010. He was shocked and amazed when the Giants offered him a tryout. The team was loaded at the wide receiver position, but he showed just enough to grab the last spot on the depth charts and make the opening-day roster. Victor played little as a rookie, due mostly to a hamstring injury. The Giants were able to stash him away on injured reserved. During the 2011 lockout, Victor received a call from Eli Manning inviting him to unofficial workouts he was arranging. The two developed a chemistry together. With Steve Smith signing with the Eagles and Domenik Hixon and Mario Manningham sidelined by early-season injuries, Victor found himself in the starting lineup opposite Hakeem Nicks. He scored a pair of touchdowns in Week 3 against Philadelphia, including a sensational 74-yard score. A clutch catch a week later helped Big Blue upend the Cardinals. Soon Giants fans were screaming CROOOOZ every time he caught a pass. With two games to go and the team’s record at 7–7, Victor made the most important play of his young career against the Jets. He caught a pass from Manning on the 11 yard line and went the length of the field to complete a 99-yard touchdown play. The catch and run turned the game around and probably turned the Giants’ season around, as they made the playoffs and went on to win the Super Bowl. Victor caught 82 passes for 1,536 yards and 9 touchdowns during the regular season. he had 21 more catches and another touchdown in postseason play. Victor picked up right where he left off in 2012, surpassing the 1,000-yard mark again and ranking in the Top 10 in the NFL in receptions and touchdown catches. In 2013, Victor missed two games because of a sore foot, but still caught 73 passes . He fell two yards short of his third 1,000-yard season. In 2014, Victor suffered a season-ending knee injury against the Eagles in Week 6. Fortunately for the Giants, rookie Odell Beckham Jr. stepped up and became Eli Manning’s prime target. With Victor on the mend, the team went into 2015 hoping to have an awesome one-two receiving punch. Unfortunately, calf injury kept Victor off the field and, after three months of rehab, the Giants opted for season-ending surgery. Victor reaggravated the calf injury in training camp during the summer of 2015 and was unable to get back on the field until 2016. On Opening Day, he caught the game-winning touchdown pass against the Cowboys—finishing off the score with an especially vigorous version of his trademark celebratory dance. The NFL later fined him for excessive celebrating. Victor managed to stay healthy most of the season, appearing in 15 games and catching 39 passes.. The Giants made the playoffs, and Victor caught one pass in a loss to the Packers. It would be his final reception as a Giant. The organization released him after the season and he signed with the Cleveland Browns, where fans hope he can team with fellow newcomer Kenny Britt to provide a powerful one-two pass-catching punch.